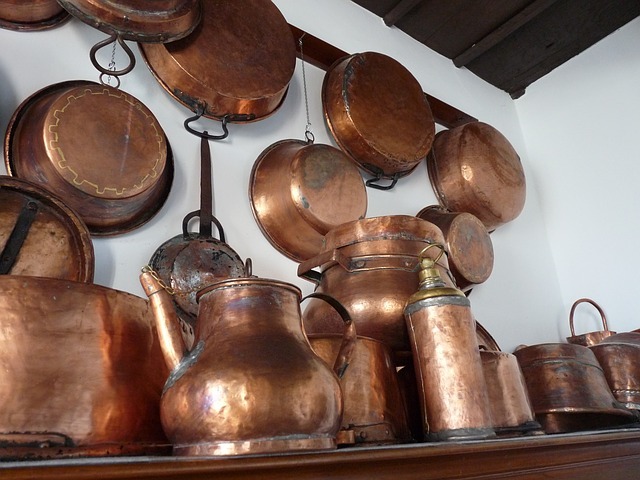 Copper pans are the latest kitchen fad. Promising better non-stick performance than teflon and better heat transmission than cast iron, advertisements make these seem like the ultimate cookware technology. The manufacturers claim that you'll never use anything like it. Independant.co.uk called it "the modern kitchen workhorse." But can these pans really live up to the hype? In this buyers guide, we'll help you find out. We'll show you what's good about these pans, as well as a few problems that the advertisements don't tell you about. Before you make a purchase, make sure you understand both the pros and cons. We'll also be taking a look at the most popular brands to find out which one comes up on top. 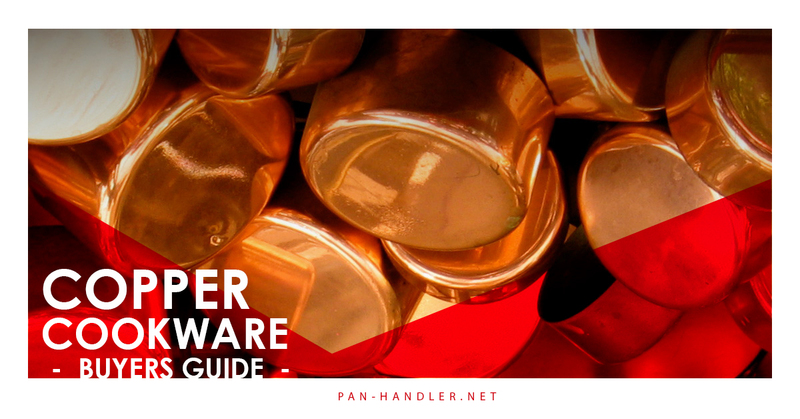 There are actually two types of copper cookware on the market. 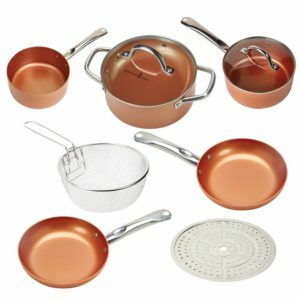 Most people are looking at copper-coated pans - something that looks very similar to a standard non-stick model. But if you're looking for something high end, many consumers choose to buy cast copper. This is built similarly to a cast iron pan, with a different metal used. This chart will help you understand the differences between them. Before we go into the specifics about these products, let's take a look at some of the most popular brands. First, we'll take a generalized look at their product lines. We'll go in-depth to show you everything they have to offer, as well as the differences between them. After, we'll help you decide which one is right for you. You can read our mini reviews below, or you can click below to read specific reviews for each product in the brands offerings. This is the brand that started it all. 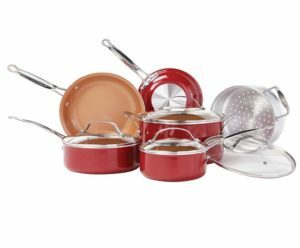 Red copper is, by far, the most well-known manufacturer of metal-infused non-stick cookware. Their products are very affordable, and have significantly better non-stick performance than a Teflon pan. Their patented coating is so impressive that many health-conscious consumers choose to prepare their food without grease of any kind. No oil, no butter, no cleanup! This is one of the first brands we'd recommend checking out, as it's considered by many to be the best copper cookware set available. Click below to find the current price, or to see our full review of all the different models this brand offers. Although they didn't hit the market until after the copper trend was in full-force, this brand offers a few unique features that you won't find elsewhere. 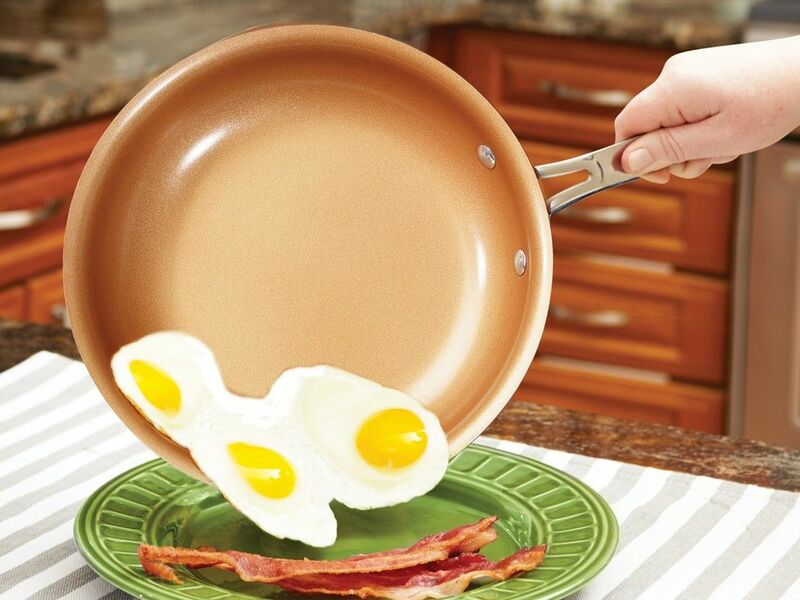 The core of the pan is made from ceramic and titanium, providing more durability than any other brand on the market. 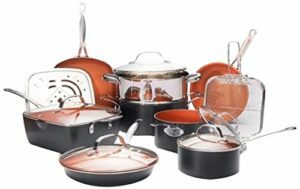 Their 10 piece set includes an oven safe skillet, which is not something you will find with other materials. Heat transmission is improved, reducing hot-spots that make it hard to cook food evenly. You will pay a little more for this brand, but experienced chefs who want more control over their food will find this to be a worthwhile investment. Want to know more? Click below to read our in-depth copper chef review, where we explore the pros and cons in much greater detail. In spite of what the name implies, you won't actually find any steel in this cookware! 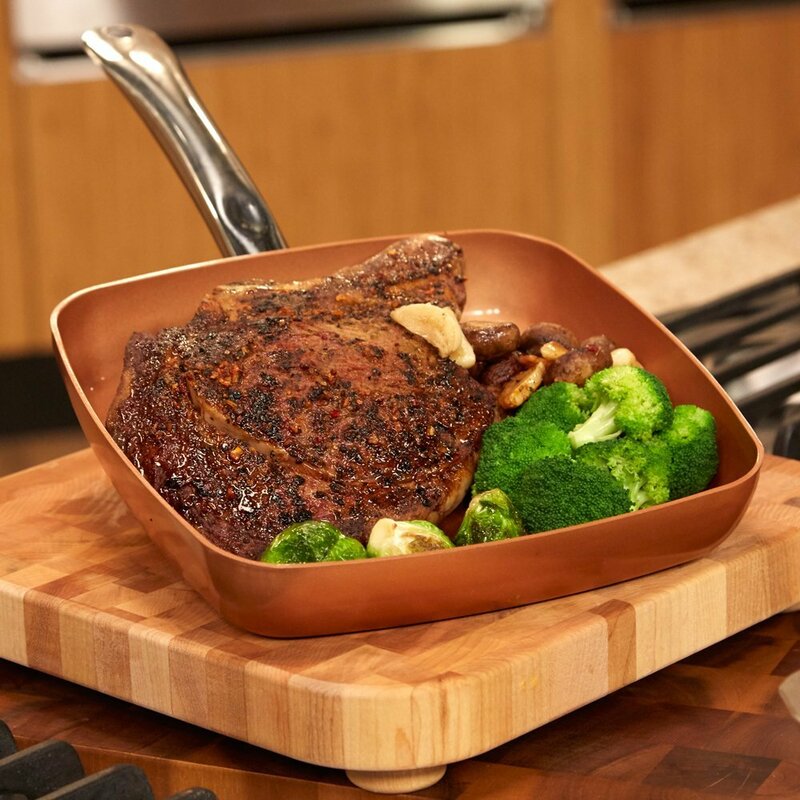 Gotham is another manufacturer that coats a ceramic pan with a copper-infused non-stick coating. Many people prefer this brand due to it's more contemporary appearance, but the main selling point is health. While most of the products we've reviewed are free of PFOA and PFOS, only Gotham Steel's unique manufacturing process removes all traces of PTHE - a chemical that is potentially toxic, and hazardous to the environment. Research is still up in the air about the dangers of including PTHE in our cookware. Some say it's harmless, while others say to avoid it. If you want to know more about why you might prefer Gotham steel over the other brands, click below to see our complete review. As with any trendy product, there are always off-brand competitors ready to take market-share away from the top-dogs. These generic brand copper pans are a popular choice among budget conscious shoppers. Their 10 piece set is often available for half the price that other companies are charging. While they do work as advertised, we had issues with durability. After just a few months, the coating was starting to get a little stickier. Even after it degraded, it was still a little better than our Teflon pan. But if you can afford a little extra, we'd recommend checking out one of the more popular brands. Lagostina is a well respected brand that has been producing mid to high end cookware for many years. 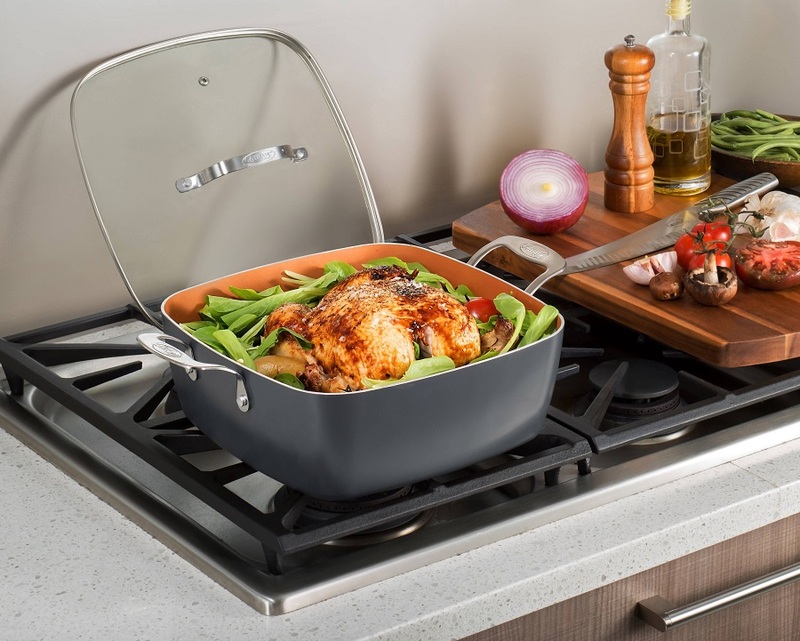 The Martella series pans are one of the most popular options for consumers who aren't willing to make compromises. 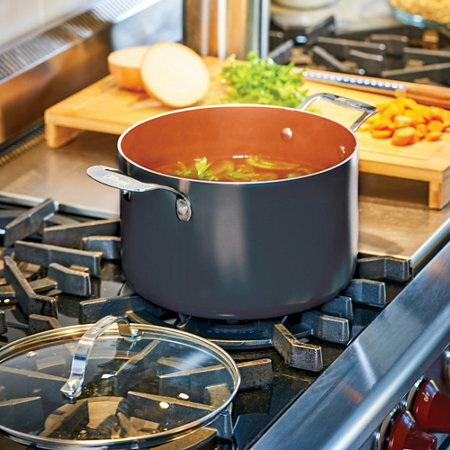 Their unique design puts a copper coating on the outer side of a stainless steel pan to improve heat transmission, reduce hot-spots, and promote fast cooling when the temperature is reduced. While these aren't made from pure metal, their luxury aesthetic and high end performance makes this a great choice for anyone who wants more than the other brands offer. If you're looking for the real deal, this is it. 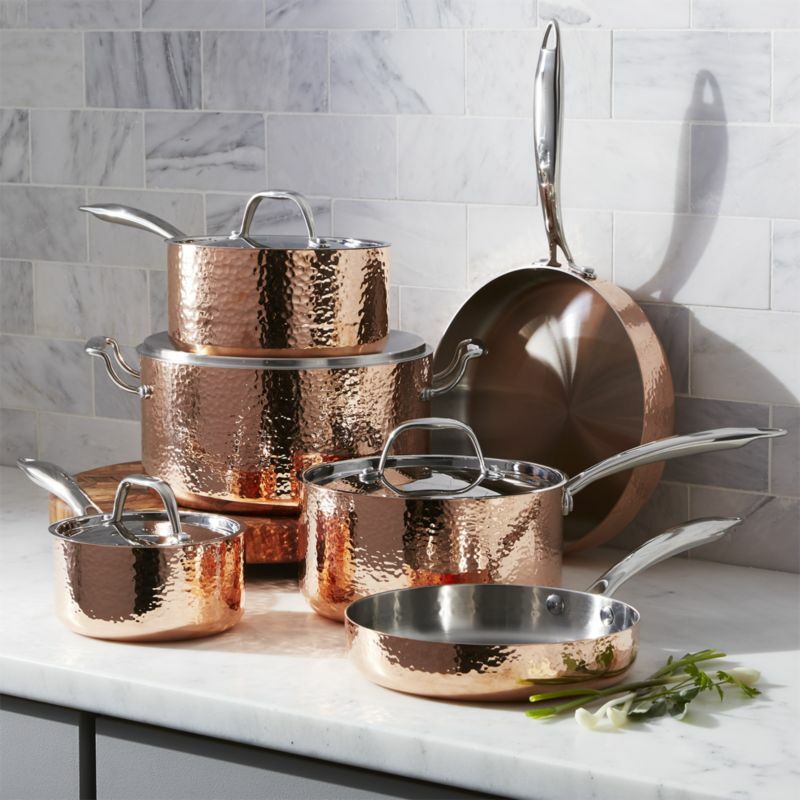 This is one of the few pure-copper cookware sets on the market. To protect the metal, the cooking surface is electroplated with steel, providing better durability than the soft metal would otherwise provide. Chef's prefer this type of construction because if gives you extremely fine control over the temperature. It heats up and cools off in seconds, so you're able to have unparalleled control over the preparation of your meal. Because copper is such a good conductor, it's often used in high end cooling systems (such as the ones used on computers) as well as in electrical wiring. Unfortunately, this makes pure copper pans very expensive. If we were grading these products on performance alone, Mauviel would be our highest rated option. Unfortunately, the high price puts it a little out of reach for the average consumer - so that's where we docked points. Most people have a cast iron pan in their kitchen. Cast iron is one of the oldest materials in use, but many chefs still prefer it due to some unique properties that can't be found in other materials. 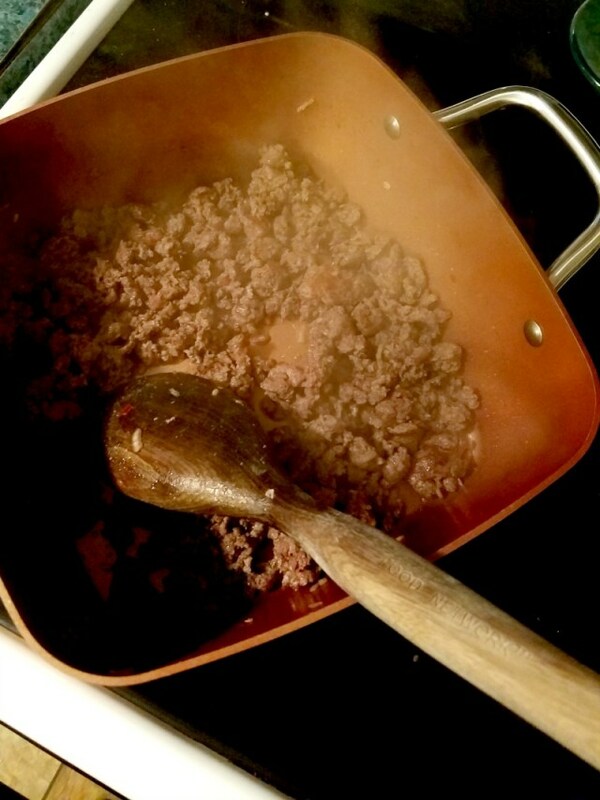 A well seasoned iron pan can give your food a unique flavor without fancy seasoning. Once heated, iron has a very even temperature throughout. The same logic can be applied to copper cookware. Copper pans are one of the latest kitchen fad, and for good reason. Many of the things people love about cast iron also applies to copper. But there are a few key differences that make these types of pans really stand out. In this guide, we're going to show you both the advantages and the disadvantages of these new pans. We'll show you the most popular products, and help you understand the differences between them. These pans can be a huge asset in the kitchen, but if you don't know what to expect you might find yourself disappointed. There are a few key reasons why copper is chosen instead of typical construction materials like cast iron or aluminum, and why it's used in non-stick coatings instead of teflon. Food doesn't stick, even when used without oil or butter. This allows you to make healthier choices in the kitchen and reduce fat in your diet. More durable and resistant to scratches. While there are plenty of benefits, these products aren't without their faults. Both types require maintenance. Coated cookware needs to be seasoned before use, and again every six months or so to keep the coating in good shape. Pure copper needs to be cleaned, and dried as soon as it's washed to slow the process of oxidization. These new-fangled pans can be broken down into two categories. While they both contain copper, there are some very important differences between them. In this section, we'll help you distinguish between the two so you can understand which one best suits your needs. 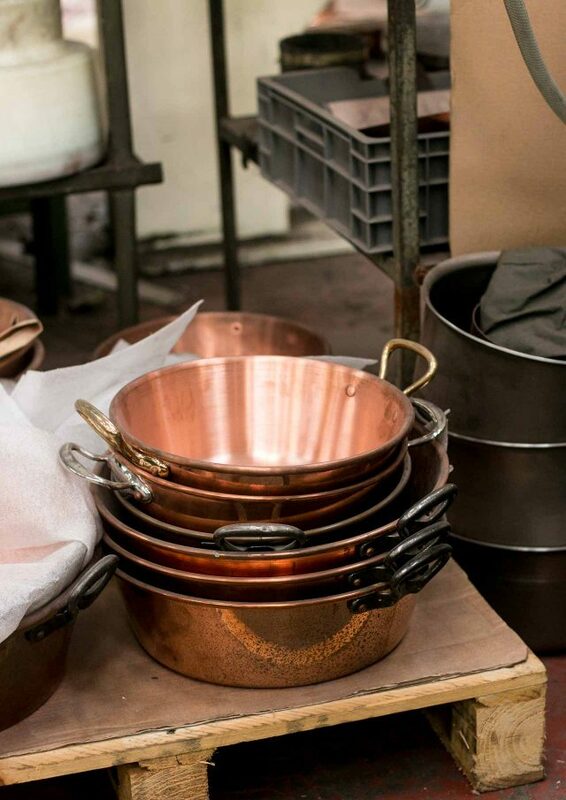 To put it simply, copper cookware is made completely from copper. Occasionally, other alloys may be added to improve durability or heating properties. But in general, these are essentially raw metal. You can think of them like cast iron, with a different metal used as the base. Why would you choose this type of pan over another? There are a few key reasons, and they boil down to these two points: Temperature transmission and heat control. Copper is an extremely good conductor of heat. For this very reason, delicate electronic components are often cooled with copper radiators. This material also has very good electrical transmission properties, making it the most common material for wiring to be made out of. For the aspiring chef, this means a couple things. Just like a cast iron pan, copper will heat up very evenly. This allows you to cook your food well, without any pesky hot-spots. Although pure copper isn't a non-stick surface, you'll still find that your food won't stick as easily as with other pans. This is because most sticking is caused by hot spots. Some parts of the pan heat up more than others. By the time your food is cooked all the way through, the hot spots have overcooked a little bit, baking your food on and creating a tough cleanup. Just the first point alone isn't a good enough reason to purchase another pan. Cast iron also provides even heat, so what's the advantage here? It all has to do with how quickly temperature is transmitted. Cast iron takes a long time to come up to temperature, and it will hold it's temperature for a very long time. This is why cast iron is such a good choice for food like pizza - which should be served on a hot pan. Copper, on the other hand, is totally different. It heats up very quickly, and cools off very quickly. If you turn the temperature down on a cast iron pan, it will take quite a while for the temperature to actually drop. Additionally, you have to pre-heat it for a while. Copper, on the other hand, releases temperature very quickly and gains it quickly. It will only take a minute or so for the pan to pre-heat to the desired temperature. When you turn the knob the other way, it will release the extra heat into the air and cool off. This means that you have a ton of control over your cooking temperature, making it the best choice for experienced chefs who want more control. One of the biggest downsides to this type of cookware is the price. Copper is very expensive. Remember, it's also used in electrical wiring. You could make a lot of cable out of the same material that goes into a single pan. For this reason, you pay a bit of a premium for these products. Purchasing an alloy can save you a few dollars, but you won't get the full advantage of this cookware. For this reason, we recommend these types of pans to experienced chefs or people who are willing to spend the money on a very high quality piece of cookware. While copper cookware has been around for quite some time, it's the copper coated ones that have been making a splash in the culinary world. These pans are inexpensive, affordable, and unique. This technology fuses the new and the old, creating a special blend of technology rarely seen until recently. These are non-stick pans, designed to compete with the common teflon material. There are two main reasons you might want to choose these pans over another type: their coating, price, and health benefits. 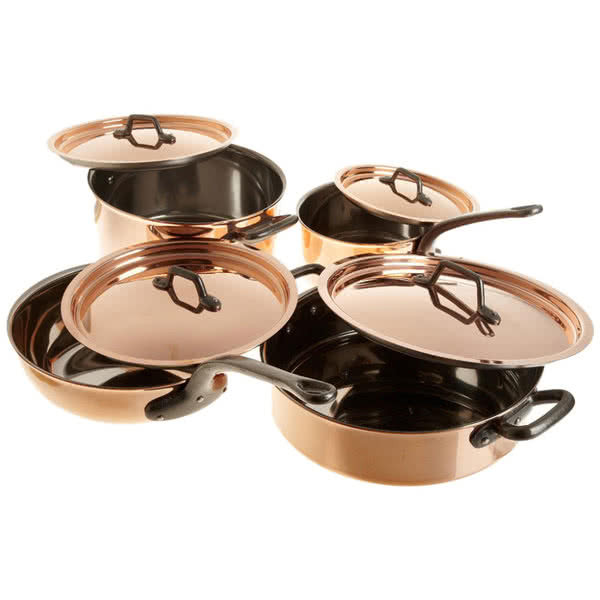 While pure copper pans are built like a cast iron, these units are closer in design to the typical non-stick variety. The core can vary from model to model, but it's generally either ceramic or stainless steel. What's special about these products is their coating. 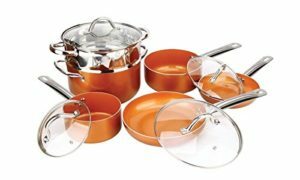 Copper takes the place of teflon and serves as the base for the non-stick coating, and there are several key advantages to this. For one, this is a much better non-stick surface. It's so much better that you can often cook food without using any oil or butter, and even tough meals like fried cheese don't leave a residue. This coating can also withstand much higher temperatures, so it's totally fine to use these pans in the oven. As it's got a metal base, this coating is much less likely to scratch or chip - making it much more durable. Since you don't have to make the entire thing out of metal, manufacturers are able to blend small amounts of copper with all of the other materials that go into the product. This keeps the cost significantly lower. Sure, you might be able to find a teflon pan with a single digit price tag, and this just doesn't happen with these units. But the average price is about the same as the average teflon model. You'll find one for less than the cost of a meal out, so it's something that the average person can afford. 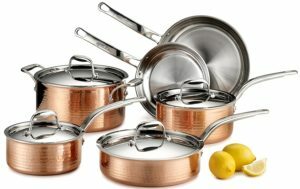 Copper pans are often advertised as being a healthier alternative to teflon pans. In some cases, these claims are justified. But others can be a bit of a stretch. The main advantage is the fact that you don't have to use butter or oil when cooking in this pan. It's got a slick enough surface that you can just prepare your food on the bare surface. If you're looking to cut fat out of your diet, these pans are a great way to do so. But this benefit isn't going to be for everyone. Even though the non stick surface is much better, cooking with grease is still a little easier. Additionally, some consumers prefer the taste of food prepared this way, so the benefit is going to depend on your cooking style more than anything. Other health claims have to do with the fact that most of these pans are free of chemicals which are known to be toxic. While nobody wants to cook their food with toxic chemicals, these claims are mostly dubious. We go into more detail on this here, explaining why this may or may not be a good thing. . These pans aren't going to be for everyone, and there are a couple issues with them. The main concern is durability. Most manufacturers love to promote how durable their pans are. And when it comes to scratches and chips, they're absolutely right. But there is another durability issue that isn't talked about very much. Over time, the non-stick coating will wear out. You can drastically reduce the impact of this by simply seasoning the pan as the direction require. But even with doing this, the pan won't work as well after 2 to 4 years time. It's inexpensive, but if you want something to last 5 or more years this probably isn't the best bet. PFOA, PFOS & PFTE: Toxic? Unless you've been camping in the woods for the last 10 years, you've probably heard of Teflon. Chances are, you have some teflon in your house. But in the scientific community, it's known by another name - polytetrafluoroethylene or PFTE. This is not a naturally occurring substance, it's a man-made chemical . Generally, it's hard to synthesize just that chemical by itself. When manufacturers whip it up, it usually comes along with two of it's buddies - PFOS and PFTE. As you'd expect, the full names of these chemicals are basically unpronounceable, so we'll save you the trouble of having to read them. PFTE is known to be toxic in humans, as designated by the National Library of Medicine. PFOS and PFTE have both been proven (in this paper) to be toxic in aquatic animals, and PFOS is banned in Canada due to it's toxicity. Cooking your food with toxic chemicals is bad, right? For this reason, most manufacturers advertise the fact that their pans are healthier since they don't contain some, or all, of these chemicals. We removed BPA from all of our plastic bottles, why shouldn't we remove these chemicals from our pans? Well, just because they're toxic doesn't mean that they're dangerous. According to the studies we linked above, PFTE is only toxic when injected. Cooking food in a Teflon pan isn't going to hurt you, so long as you don't plan on eating the pan itself. The same is true for PFOA and PFOS. Unlike the first chemical, these latter two are very harmful for aquatic life. The main reason they are being removed is environmental concerns - nobody wants this stuff leaking into our wetlands and hurting fish. So, in general terms, pans free from these chemicals aren't inherently any safer than your everyday teflon pan. You can feel good about saving the fishes, but you shouldn't worry about using your older pans. However, there is one exception to this. When heated to a very high temperature, PFOA can break down and gas off, leaking into your food. This is one of the main reasons why teflon pans aren't oven safe. Copper pans, on the other hand, are totally safe to use in the oven.